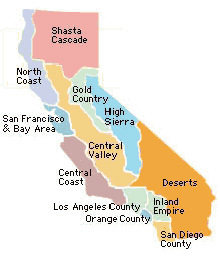 The Shasta Cascade Region borders Oregon on the north, Nevada on the east and the North Coast Region, the Gold Country and the High Sierra Regions on the west and south, this is California's northern-most region and includes two famous mountains: Mt. Shasta and Mt. Lassen. The Shasta Cascade Region is serene, beautiful and rugged -- providing a paradise for outdoor enthusiasts. You'll find every type of recreation available -- hiking, rafting, canoeing, skiing and exploring forests, waterfalls and volcanic landscapes. Lake Shasta and Lake Trinity are favorites for house boating and other water sports.